Greetings, I am Lord Melchizedek, the overseer and Logos of the Universal Level. It is my purpose as an Ascended Master, a source of the Melchizedek consciousness and as a Christed Being to bring forth a sacred message to you at this most powerful time of your ascension. 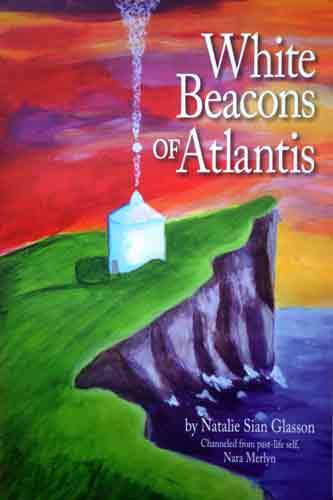 The energies anchoring at this time support openness, connection, empowerment, love and accessing your genuine self. This means that your ability to communicate with the Inner Planes is heightened and your ability to receive from the Inner Planes is empowered. Thus, a great wealth of wisdom, understanding, support, love, healing and guidance is available to you now, and you are being supported in receiving from the Inner Planes. Often many human beings feel a disconnection with the Inner Planes, even if they are aware of the Inner Planes, they see their earthly reality as completely separate. ‘Calling forth from the Inner Planes,’ is a process that not only allows you to re-recognise the bond and synthesis between the Earth and the Inner Planes, realising their oneness, it also allows you to step into your power, releasing all forms of lack. ‘Calling forth from the Inner Planes,’ is a simple process of calling the energies of the Inner places into manifestation within your physical reality. It is the perception that all you require is within the Inner Planes and simply requires to be anchored by you into your reality, which is most needed. With this perception and believe embodied, meaning that it is unquestionably true for you, then the act of calling forth from the Inner Planes becomes a powerful and magical tool of creating your reality the way you wish to live it on the Earth. I, Lord Melchizedek, wish to guide you in a meditation to promote your understanding and experience of the abundance that you wish to experience on the Earth being present upon the Inner Planes. Please allow yourself to breathe deeply and enter an alert and peaceful state of being. Imagine, visualise or acknowledge your presence upon the Earth, where you are right now, what is around you and the reality you experience. Feel yourself grounded into the Earth. Imagine, visualise or acknowledge that all around you and within you in multicoloured light, this represents the Inner Planes, the Creator’s energy and dimensions are present within and around you. Recognise that abundance, prosperity, health, healing, material objects, experiences, in truth everything that is possible to experience on the Earth is present in energy and source form on the Inner Planes. It is from the Inner Planes that the energy of anything and everything you wish to experience and have previously experienced is drawn from and anchored into your reality. Allow yourself to realise that anything and everything is available to you. Breathe the abundant and fulfilling energy of the Inner Planes into your being and reality. Recognise that the Inner Planes are ready to serve you. First, there is a need to understand and recognise where in your life or reality you are experiencing lack. What is this lack like and what would create the fulfilment instead? Thus, dissolving the lack currently being experienced. When observing the lack, allow yourself to explore the experience of lack, how it makes you feel, how it impacts your reality and self-esteem as well as the source of the lack. The source of the lack can be an emotion, past experience or something you call yourself. When you allow yourself to fully explore the lack for what it is, then you can clearly understand what you are missing in your life. An example, maybe you lack money, rather than simply deciding you need money, first engage with the experience of lack of money and discover what it is like to live your life with lack of money. In doing so you will discover what you are missing which could be self-worth, confidence, a feeling of being abundant, self-trust or something else. This helps you to acknowledge all levels of your experience of lack of money, from the physical experience to the impact it has on your being. With this understanding, you can formulate in your mind that which will create fulfilment, which in fact may be a few things, such as money, self-trust and a belief in your ability to create, it will be different for each person. Once you have formulated an idea of that which will create fulfilment and dissolve the lack, then allow yourself to feel the resonance of the energy of the idea within your being. Feel as if you are embodying the energy of the formulated idea, vibrating as it. Take some time to experience this energetically, breathing the energy awoken and gifted to you from the Inner Planes into your being and reality, recognising how it impacts your being. Continue to use the invocation each day to call forth from the Inner Planes that which you wish to experience. This means that it is advisable to focus upon the grounding of no more than three areas of fulfilment from the Inner Planes each day, as otherwise, you will not be available and present to recognise when the energies of the Inner Planes materialise. Through this process and invocation, you are grounding the energies needed from the Inner Planes, then there is a need to allow for the materialisation process to take place which is the transformation of energy into physical matter or experience. In some cases, this could be instant or in may take some time. Patience and your continued focus upon the Inner Planes as a source of abundance of all forms, and your powerful tool of grounding the Inner Planes into manifestation upon the Earth will assist the manifestation process. Our purpose at this moment is to deliver the truth through our beings to you. 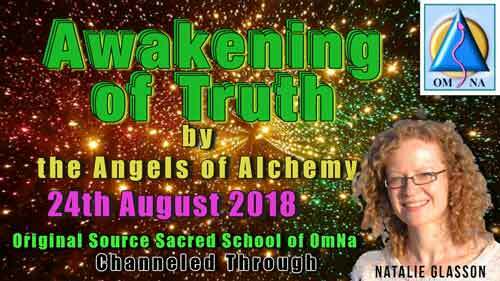 We are the Angels of Alchemy, we currently reside within the 7th Ray of Light, using the power surge of this ray devoted to the awakening ascension to support our mission of the alchemy and empowerment of truth. Please call us forth to be with you as you read our expression of energy to you through our words, we wish for you to experience our presence around you as well. We are instigators of inspiration, revelations and enlightenment, we bring forth to you a new clarity and opening that allows you to step into your truth and awareness of your truth. 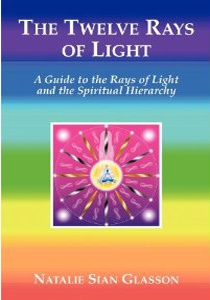 Our light is extremely bright and instantly attunes you to a higher vibration and aspect of your being, thus resulting in a clearer perception of yourself beyond illusions and the ego. This is such a blessing as it allows you to step into an aspect of yourself that you may never have previously considered or contemplated. As the Angels of Alchemy of the 7th Ray of Light, our purpose is to instigate the synthesis of the Creator’s light to create a transformation. A transformation is a shift or opening of new energy. We recognise all energies as expressions of the Creator, whether you perceive them as negative or positive. We realise that when a negative energy, feeling or emotion activates within your being it is because you are not recognising a beautiful loving expression or energy of the Creator within you. 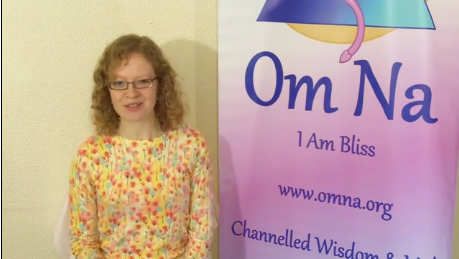 A negative feeling or emotion is a response to a blindness within you to see, sense or acknowledge a powerful light expression which would serve you in the situation you are currently experiencing. We the Angels of Alchemy assist by directing you to the Creator’s expression within you that you are not allowing yourself to see or recognise which has the potential to ground the Creator more fully and empower your being. We assist you in connecting to the core of this Creator expression and fully embody it. There is a purpose for this as it heals and liberates you and brings transformation or at least a new perception to your current situation, an opening which may not have been visible before. With this new energy activated, we, the Angels of Alchemy, wish to further your experience of transformation or an opening of an energy flow to serve you. We, the Angels of Alchemy bring to you an energy or expression of the Creator which when synthesised with the energy discovered within your being will truly create a shift. While it seems as if the energy is given and delivered through us into your being, we are simply demonstrating to you a reflection of the same energy within you. In many ways the energy previously activated which we will call energy one and the energy we transmit/ activate within you which we will name energy two, have always been present within your being and are united and synthesised already. The alchemy and transformation we speak of is not the integration of energy one and energy two, as this has always been the case, instead it is the realisation of the united energies which brings both energies into embodiment within your being, body and reality. When energy one and energy two are grounded into you, they create a shift as if your entire being is reprogrammed and realigned to the energies. The true experience of the alchemy process becomes fully present within you, creating empowerment, new realisations, clarity and a new energy to create from. It is an awakening of your truth that allows you to become your truth and even realise your truth. We the Angels of Alchemy, support this entire process especially the grounding of the united energies into your entire being and reality. To further your experience with us and to assist you in acknowledging that which we speak of, we, wish to share with you a summary and step by step guide for you to use in your everyday life. Realise a negatively impacting situation in your life or a limiting feeling, sensation or mood when it arises in your day. Let your awareness of yourself observe and acknowledge when you are impacted negatively without judgment or even creating an opinion. Realise that the negative or limiting energy such as anger, fear or sadness activating is manifesting because you are not allowing yourself to view, accept and embody an energy or expression of the Creator that is awe inspiring and will serve you. Be willing to view this energy that is already present within you. Ask us, the Angels of Alchemy, to lead you to this energy or expression of the Creator which will serve you and is within your being now. As you focus within, let us guide you to a liberating energy and aspect of the Creator that is waiting to be acknowledged. Ask us, the Angels of Alchemy, to support your full experience of this sacred energy so you feel you are embraced in the energy. Now take time to view that which occurred within your reality or the thought that created your limiting and negative feeling, how does it feel now? Are you able to see from a new perceptive or with greater clarity? Call upon us, the Angels of Alchemy, to bring forth to you an energy or expression of the Creator that when recognise within you as united with the energy you have just activated would create a shift and lasting opening of energy within your being and reality. Experience, breathe in and absorb the light and energy we share with you, accept it into all aspects of your being and allow yourself to recognise how the energy makes you feel and that it is activating from within your being. Acknowledge the two energies, energy one and energy two, recognise they have always been present within your being and are always synthesised and united. Take time to enjoy the insightful and illuminating process. When you feel ready think of the situation or thought that created the negative or limiting feeling and allow yourself to perceive it differently, accessing a new understanding and realising the action that needs to be taken. We, the Angels of Alchemy, perceive this as an awakening of truth within your being and a connection between your truth and your reality which is so vital now in the current stages of ascension. We are present to serve you in recognising your truth in the most loving way. It is important to realise that you are an embodiment of the alchemy of the Creator, it is through your being that openings for the Creator’s energy to transform and open into new possibilities take place. Take a moment to acknowledge and embody this understanding fully. Divine blessings extend through my being to your essence and truth, I am Lady Portia, I am the sacred feminine aspect of Saint Germain. It is my purpose to oversee the awakening of the New Age of Ascension through the 7th Ray of Light expression of the Creator. Within the 7th Ray Ashram upon the inner planes of the Creator’s Universe, the Violet Flame of Transmutation and Transformation is fully anchored and present. I Lady Portia, wish to enrol you into a deep purification and transformation of your entire being with the purpose of becoming present with your essence. In doing so, I, Lady Portia, wish to create a sense of space within your being and reality to aid your manifestation of your essence. When you clear that which blocks your essence, you allow your essence to unfold and manifest within your being and reality in exciting and liberation way. My love is present with you now. Allow yourself to feel, sense and acknowledge the presence of my love all around you. Please breathe my love into your entire being and imagine the energy of my love integrating with the loving presence of your essence within each cell and aspect of your being. Allow yourself to experience this fully. Take this question into your heart and let it rest there, observing the answers and responses that awaken into your awareness. This question will allow you to witness your reaction to love and your thoughts about love, as well as your relationship to divine love. I will share with you that my love is born from the same source as the love you embody and express. My love and your love are expressed and utilised in different and diverse ways. Therefore, our love is the same while embodying a different purpose. However, the goal of our love is the same. This signifies that the journey and expression of love can be different. In recognising this you accept that your source is the same while you have the freedom to be your unique essence or soul without judgment for yourself and others. You give yourself and others permission to express the flow of truth while recognising the oneness that is always present. This is truly liberating and allows judgment and the need to understand to fall away. You create a space for your truth to be present within you and through you while honouring the same within others. I, Lady Portia, wish to share an invocation with you to support you in enrolling in the Advanced Levels of the Violet Flame of Transmutation Energy. The Violet Flame is an expression of the Creator which cleanses and realigns you with your truth. It is often recognised as a large violet coloured flame of light that is constantly active and glows brightly. The Violet Flame has the ability to cleanse any aspects of your being and reality, with a simple invitation, intention or request. The advanced levels of energy of the Violet Flame could be described as the purest vibrations of the energy and consciousness. The advanced levels not only cleanse your being, they cleanse your being to further awaken and aid the embodiment of your essence, creating Expanded Liberation. Within your expanded liberation you have the opportunity to recognise the presence of your essence as a core and foundation of everything you are and everything you create. The presence of your essence becomes so grounded within your being that you truly recognise it as a part of you, in truth as you. Therefore, releasing illusions that hinder and block you from being the presence of your essence in your reality upon the Earth. Through this invocation, you have the opportunity of experiencing a deep and breathtakingly beautiful transformation within your being which will influence your relationship with your inner love and pure essence. Allow time for a full experience. While the Advanced Levels of the Violet Flame can release illusion to bring forth and ground the presence of your essence, there is also a possibility of cleansing and purifying your awareness. This means your awareness of yourself, reality, the world and your spiritual growth as well as the soul awareness. Thus, your entire lineage of light, meaning all that you are as a light being, can experience a powerful cleanse awakening your soul into expanded liberation and further freedom to exist as the truth of the Creator. Enrolling into the Advanced Violet Flame Purification requires you to state the invocation I will share with you each night before sleep for 28 days, this will allow time and space for the full purification of your light lineage. 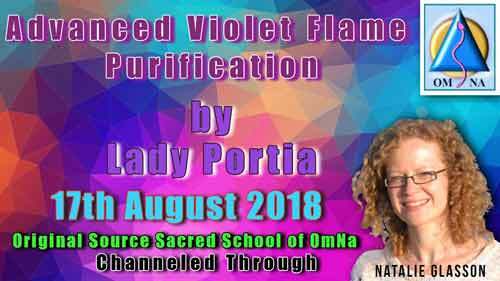 It is only if you repeat the invocation for 28 days without stopping that you will receive the full benefits of the Advanced Violet Flame Purification. Simply read the invocation silently or out loud and then lying down breathe deeply, breathing the violet flame energy into your entire body and being, you will naturally fall asleep allowing the Advanced Levels of the Violet Flame to continue its work with you. When the necessary cleansing and purification takes place for that night the Violet Flame will withdraw, and Angels of Love will surround you until you wake from your sleep. As you are breathing in the Violet Flame energy before sleeping you may wish to hold in your mind expanded liberation, the grounded presence of your essence and the purity of your awareness being empowered. Stress is a general word that covers a multitude of feelings and inner experiences. Anxiety, tension, worry, nervousness, and trauma can all be described as stress and yet each can be a completely different experience and have different impacts upon your entire being. Stress can be experienced in certain areas of your body, mind or emotions or as a full body experience. Stress is a reaction within you which can take place due to thoughts, emotions, memories of the past, fears of what could happen, a traumatic situation of the present or can seem to manifest due to situations within your reality. Stress is such a common experience in everyday reality that people believe it to be a normal and natural aspect of existence upon the Earth. There are many types of stress and many ways in which stress can be activated. However, I, Saint Germain, wish to share some insights with you to aid the release and healing of stress within your entire being.